Practical Welding Letter wishes to all Readers and their Families a Happy, Healthy and Prosperous New Year. This 125th issue opens with an unsettled question on how the microstructure originated by Friction Stir Welding affects the mechanical properties of welded joints. Readers with experience in this issue are invited to share their insights. (See Section 2). Job Shops are courageous enterprises that struggle daily to consolidate their achievements. A few tips from an expert might suggest some good habits to adopt for improved control. (See Section 3). Aluminum welding is highly sensitive to the quality of the consumables employed. Two reports of successful operations might hint on possible improvements in different situations. The first reported article explains how a productive industrial fabrication activity is run for consistent results, by investing in modern equipment with waveform control and by selecting one of the best available, controlled chemistry consumables to assure production quality. The second suggest a way to improve welding productivity by changing to a larger diameter wire while adjusting other parameters for avoiding inconsistencies. (See Section 4). Further down the page on can read of modern robotic modern laboratories, capable to produce economically huge quantities of reported results, as required by automotive industry from component suppliers. (See Section 7). In section 11 we report on an interview of primary Scientists involved in the development of new materials and processes as to the challenges and the hopes of the work ahead. The tools now available and the lessons learned already permit to build new materials starting from scientific knowledge and from the properties one wants those materials to display. In the words of one of the Panelists: "This is a tremendous time to be materials scientists and engineers". Never before were such tools available, which confer power bordering with Magic. And also: "The rate at which new materials and understanding can be implemented is also increasing". The regular columns are published at their usual place. Readers looking for information are urged to browse the Site Map page and the Welding Resources page. We hope that some of the matters dealt with here will be enjoyable reading to you. You might wish to research in some more depth the subject nearest to your interests by typing the keywords of your query in the search box appearing on almost every page of this website. "The article on friction stir welding of dissimilar materials was quite interesting. My question is that since Friction Stir Welding (FSW) generally provides higher strengths than fusion welding, is there any study indicating the changes in the microstructure that could possibly be the cause for this?" Such a study is easier said than done. To check the issues I tried a web search for the query: "Microstructural changes in Friction Stir welding". The results page is overwhelming with references. In general the results reported are for definite metals and also for specific processing variables. Readers can find a version of the Search Page in Bulletin 91 and browse for correlations in systems similar to those that interest them. Not all the articles are freely downloadable so that a comprehensive study could be performed only within an academic institution enjoying total free access. Post Weld Heat Treatment (PWHT), when applied, is reported, together with mechanical properties results. The results show that the rotational and longitudinal speeds have a significant effect on the microstructures as well as the mechanical behavior of the welded material while a fine grain structure is produced at higher ratio of rotational speed to longitudinal speed. A clear indication that mechanical properties are improved by FSW is not universally reported. Even if tensile strength and yield increase, that may come with reduction in elongation properties. Some authors point out that Mechanical properties exhibit linear relationship with heat input. 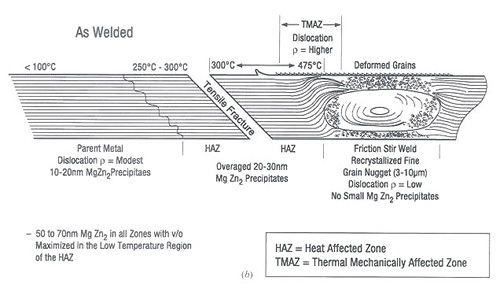 Different zones are identified in the weld microstructure, indicated as stir zone (SZ) also known as Dynamically Recrystallised Zone (DXZ) or weld nugget, thermal mechanically affected zone (TMAZ), and heat affected zone (HAZ). Unaffected zone is indicated as Base Metal (BM). Various kinds of failure modes were observed in some tensile tests, after suitable welding parameters were determined. 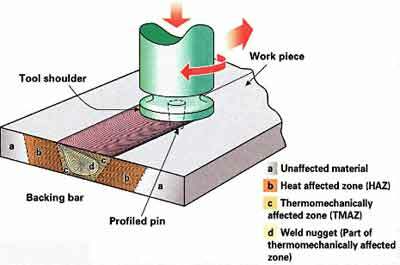 Precipitates present in heat treated base metals undergo substantial modifications when Friction Stir processed. An author reports that in their investigation the tensile strength of the joint was lower than that of the parent metal. However other studies report that "Material processed using multi pass FSP at 30 mm/mins showing higher mechanical strength as compared to base material." Some researcher seem satisfied if tensile test results reach a substantial proportion (~70%) of base metal strength. A Researcher wrote in one of the Papers, that the microstructural evolutions occurring during FSW are still not well understood. From this short review it would seem that generalized conclusions cannot as yet be drawn for FSW. Therefore specific research is needed for validating practical applications. The most informative articles are possibly those which give clear indications on what should be done in certain circumstances. The best are certainly dictated by experience. Believing that one should never dismiss helpful tips, I am convinced that even welders with long experience could profit, finding some interesting hints, by browsing through recommendations suggested by long familiarity with practical problems. Such is the article, published with the above title, in the Welding Journal, December 2013 issue, at page 30. The author points out that the goals of improving productivity, ensuring the best quality and reducing costs are all important for any manufacturing enterprise, including job shops. The author suggests that investing time and money in ongoing training for the workforce can provide significant long term benefits to job shops. Greater efficiency, better teamwork, and personal involvement in the processes reduce downtime, inefficiencies and lost productivity, improving the work quality. Proper and effective Fume extraction creates a cleaner, more productive job shop. The author suggests to get help from a qualified industrial hygienist to plan for the best solutions for fume control. Introduction of suitable means and employee training to minimize exposure, protects the workers and contributes to promote loyalty to the shop. Suitable attention to proper filler metal storage and handling are essential to guarantee production high quality. Simple but strict routines and disciplined actions becoming natural habits help job shops get the best performance out of consumable products and minimize costs. Welding information management is now much more easy and friendly than in the past. Besides parameter control obtained with stored programs available for each job, the real value is provided by software permitting recording and analyzing actual production data generated by equipment. The value of this modern technology appears when production output is compared to acceptable limits or standards, so that the job shop can identify potential process variability and possible causes of quality drop. A final reminder points out the well know but sometimes neglected fact that real economy is possible when all consumables produce the best quality and help avoid additional expensive operations to correct for poor performance. The article conclusion is that in the long run, exerting constant attention to details can pay off handsomely in productivity and quality gains along with reduced costs. Interested Readers are urged to seek the original article pointed out above. Two articles deal with aluminum welding consumables in the last December 2013 issue of the Welding Journal. One, at page 26, describes a particular application where a company recently set up a manufacturing facility with integrated welding operation for manufacturing floors of refrigerated trailers. The author, Frank Armao of www.lincolnelectric.com , points out that the successful outcome of consistent weld quality, is due to the correct combination of three key factors: the right equipment, the right waveform, and the right consumable, especially important for production with automated systems. The production goal is achieved by a welding machine with pulse waveform technology for automated operation. Both the waveform control and the latest inverters operate at 120 kHz, with waveform capable of changing very quickly. Modern advanced process welding power sources can react much faster to a higher level of detail and regulate the process with more precision, including both wire feed and travel speeds. While monitoring the automated operation, welders have the ability to maintain better control of the arc, which can adapt not only to gaps but also to material and joint variations. In automated systems, welds can be made faster without inconsistencies and loss of weld pool control, eliminating spatter, incomplete fusion, and undercut, while avoiding discontinuities in the weld and reduced quality. The author extols the value of the specific filler metal selected, explaining that this aluminum alloy 5356 GMAW wire was designed to provide weld pool clarity and arc action, as well as wetting for both semiautomatic and high productivity automatic applications. Additionally, its controlled chemistry contributes to a consistent bead profile and appearance for a smooth surface finish at high travel speeds, while chemistry control supports mechanical properties, flow and operability. The other article at page 38, from author Rob Krause of www.alcotec.com , explains that increasing wire diameter for aluminum GMAW (Gas Metal Arc Welding) can boost productivity, if other procedure modifications are taken care of. In his words, "The advantages of increasing wire diameter include better fusion and penetration, increased travel speeds, higher deposition rates, lower price/lb, and better feedability." To increase the deposition rate one could use a larger diameter wire with corresponding higher current to improve penetration. But one has to ensure that the wire is always on the leading edge of the weld pool, to avoid the higher chance of arcing off the weld pool, that can have a negative effect on penetration. To counter that, the author offers two tips. Either increasing travel speed and push angle or running the weld slightly uphill. Of course the increased amperage must be supported by the power source, and the excess heat must be controlled by a suitably cooled torch. Improving productivity through wire diameter increase can be easy, but one must assure that the quality is not impaired. The subject of procedure improvement is dealt with also in our new page on Process-optimization, introduced in section 8 further down this page. Interested readers are urged to look for the original articles pointed out above, as essential information may be missing in these summarized versions. Forge Force in Resistance welding is the amount of compressive force applied to the weld after the end of the heating portion of the welding cycle. Heat Input Rate, relative to arc welding, is the energy per unit length of weld, supplied by the arc to the workpiece. Postweld Interval, in resistance welding, is the total elapsed time from the end of the weld interval to the end of hold time. Resistance Welding Die is an electrode shaped to the workpiece contour, to clamp the part and to transmit electric current. Seam Weld Size is the width of the weld metal in the plane of the faying surfaces. Test Specimen is a sample of a test coupon prepared for testing. Ultrasonic Testing Operator Qualification is the record of the proof of training and experience authorizing employment as nondestructive ultrasonic examiner. Weld quality is narrowly confined to the physical characteristics examined by inspectors, but should prove the fitness for purpose of a weld. The economic drive to reduce human intervention as much as possible in all production facilities, could not skip the Laboratory where lots of standard specimens are routinely tested for conformance of their properties to requirements. Material specimens are tested to validate properties following heat treatment or other manufacturing operations. Mechanical properties like hardness and tensile strength, following definite processes, are tested to document the real material condition. Such testing procedures used to require the individual attention of laboratory technicians educated to perform the required tests and to record the results. An article published at page 20 of the magazine Advanced Materials & Processes, an ASM International publication, for November-December 2013, illustrates the present advances embedded in today automated testing laboratories. The first requirement involved providing measuring instruments with accuracy and repeatability of results, capable to eliminate variation due to different operators. Then the introduction of automation and robotics, duplicating the successes already obtained in production lines, aimed at increasing quality and productivity while reducing costs and maintaining flexibility. Robots are integrated with sophisticated software to provide the continuous supply of identified specimens to the testing instruments, that conduct each its autonomous test and provide the required reports. Automotive components supply chain, which is usually divided among several suppliers, requires quality assured parts. Strict qualification routines are used to approve suppliers. Then testing protocols are established to assure supplier quality and traceability. Suppliers that automate the testing process can produce the required certificates of conformance for every part supply with the utmost level of testing accuracy and within the tight time schedules demanded by production programs. The low cost obtainable for each automated test, besides increased accuracy and reduction of human error, delivers a high return on investment. It is claimed that a complex system can be paid back in as little as two years. Interested readers are urged to seek the original article that shows a specific system offered by a commercial company. Our website www.welding-advisers.com was enriched this past month with three new pages. The first page proposes a Welding Overview and, as its name implies, provides a general perspective and some provisional explanation on what is included in welding. Different process types, grouped by some common characteristic, are outlined. It is hoped that this page be useful to those in search of basic understanding of the welding subject, to better organize their knowledge. It should be accepted that this complex matter requires considerable attention and long time application. To view detailed explanations of the essentials of single processes one can follow therefrom the links to pages that elaborate on their characteristics. This page should help to put some order in the proper use of words to define specific methods and to avoid errors when referring to certain processes. It may be important to be aware that it was and still is possible to build constructions without welding at all. Performance and safety are primary concerns, but cost is a compelling limiting factor. The second page, on Process Selection, outlines the criteria that should be taken into account when looking for a suitable solution for a specific application. In every occurrence one should remember that certain materials are best welded by selected processes. Compatibility may be the first requirement. Then special precautions may be needed to assure acceptable results. The development of adequate welding expertise requires full acquaintance with different processes but also basic metallurgical understanding of characteristics and behavior of single materials. Studying examples of successful given applications as described in technical literature is a recommended way to develop confidence and experience in welding technology. The last added page deals with Process Optimization. The difference between an acceptable welding procedure and an optimized one may be substantial in terms of productivity and of gain. It is certainly possible to try to improve empirically any given acceptable method by trying to push a little those parameters which are known to increase weld deposition rate without introducing instability in the process. But the preferred procedure is to learn to do so in a systematic way by using the scientific approach of available Design Of Experiments that permits to test results obtained by changing multiple parameters in a logical sequence and to assess which changes cause the optimized improvement. The scientific method to do so is explained in specialized documents, a few of which have been indicated in the page. We will try to collect further practical information and will publish results as soon as possible. Readers are invited to see the new pages and to comment as they feel fit, by sending us their notes on the Contact Us form, as usual. the Site Map and by jumping, through the links, to the pages that may interest them. ...that grants are provided to promote photovoltaic technologies? ...that more hiring is just around the corner? ...in which areas to target innovation? ...the Manufacturing Trends to Avoid? ...where is a Low-Cost Open-Source Metal 3-D Printer? Academia. 9.1 - Desulfurizing is the removal of sulfur from molten metal by reaction with a suitable slag or by the addition of suitable compounds. 9.2 - Electromotive Force Series (emf series) is the arrangement of a series of elements according to their standard electrode potentials, with "noble" metals such as gold being positive and "active" metals such as zinc being negative. In corrosion studies, the analogous but more practical galvanic series of metals is generally used. The relative positions of a given metal are not necessarily the same in the two series. 9.3 - Flow Lines are patterns of texture showing the direction of metal flow during hot or cold working. Flow lines can often be revealed by etching the surface or a section of a metal part. 9.4 - Green Rot is called a form of high-temperature attack on stainless steels, nickel-chromium alloys, and nickel-chromium-iron alloys subjected to oxidation and carburization. The attack occurs first by precipitation of chromium as chromium carbide, then by oxidation of the carbide particles. 9.5 - Hole Expansion Test: a flat metal sheet specimen with a circular hole in its center is clamped between annular die plates and deformed by a punch, which expands and ultimately cracks the edge of the hole. 9.6 - Inoculation is the addition of a material to molten metal to form nuclei for crystallization. Fish Found: The Greatest Conservation Success Story of 2013? As reported in two past issues of Practical Welding Letter (PWL#123 and PWL#124), new computational tools are being developed to advance Materials Science and Engineering. The new tools are expected to help in producing rapid advancements in the development of new materials and processes to confront the challenges and the needs of the World in the next future. In their last issue for November-December 2013, at page 25 of the magazine Advanced Materials & Processes, an ASM International publication, the editors interviewed a small Panel of qualified Scientists asking them on their opinions on the most promising areas of materials engineering Research and Development for the next few decades. One of the Panelists exposes his views on the needs of hypersonic flight, for materials and systems to handle that environment, and on improving mechanical properties per unit weight and energy efficiency. Another speaks of the mobility needs that will require improved energy storage devices. One Panelist stresses the needs of better understanding of biological structures, modifying our approaches to sustain a rich ecology or influencing medical research into disease and treatment options. Another scientist points out that increased investments should be devoted to research and development, to excel in educating young people and to create attractive business environments. The panelists agree that Integrated Computational Materials Engineering (ICME) is a great innovation. One of the participants would welcome the development of science based corrosion models. Another, who think that much more still has to be done, asserts that richer resources and funds are needed for productive advancement. Theory also will be needed in addition to computation, and experimental data to provide fundamental measurements. Microstructure modeling ought to be coupled with mechanical behavior modeling, but it may take 20 years more: at present the two groups of modelers are working separately. One of the contributors affirms that "The Materials Genome Initiative (MGI) will help to build the national infrastructure and public-private partnerships to support this critical integration of materials understanding with other engineering disciplines." On the contribution of Additive Manufacturing (see also PWL#106 Section 2) the panelists agree that the technology has real promise but also natural limits. It is conditioned, for powder metals, by the extremely large ratio of surface area to volume. Possibility are seen in graded structure applications (where composition and properties vary slowly with physical location). Nanotechnology was applied well before its name was introduced. One of the panelists affirms that "What is new in true nanotechnology is the level of predictive Integrated Computational Materials Engineering (ICME) control of nanodispersion strengthening in the design of precipitation strengthened alloys". Another is confident that progress will produce new non catalytic materials made to behave as rare and expensive metal catalysts. That ability to manipulate materials at nanoscale is perceived as a revolution. A member muses on the "historic corruption enabled by extreme public/private collusion". Such corruption is charged with undermining the global economy, affecting all sectors including the value system of research universities. This member suggests that establishing a National Engineering Foundation could restore the practice and teaching of technical value creation. The major challenges are seen in the urgency of providing clean water, clean energy and sustainable food production for the growing world population. Technological progress is urgently needed in energy conversion, transmission, storage and efficiency to be met by technological advances. New materials are needed for nuclear fusion to be used for energy generation. Also scarcity or depletion of resources will promote innovation, while straining national security requirements. The role of ASM International, celebrating the first century from its foundation, is praised as an engine in the development of new materials and technologies. ASM is encouraged to continue providing forums for the exchange of information and testing of new ideas, educating and motivating young people to enter this field, and in advocating national policies for broad support of the sciences and engineering. Interested readers are invited to seek the original publication for getting first hand impression of the issues discussed and for making their own unbiased opinion. Comments and feedback are welcome. Please use the Contact Us form. Can you offer some advice as to the best choice of material of the two with regards to the work hardening and UTS/fracture issues? I am really interested in pursuing meaningful correspondence with my readers, to become more involved with their needs. Readers who ask questions are entitled to pertinent answers. It is what I would like to offer, creating in the process a certain personal bond. Unfortunately many questions are formulated with insufficient information, so that too often, just to understand the question, I would need much more detail. There are many causes to the fact that sometimes my answers are unsatisfactory. I am aware of that. Possibly the question is too complex to be answered in a short note. To be complete it would need a few pages. But most often it cannot be answered because the case is undefined in critical aspects. Anyhow, if the inquirer has a genuine interest, additions and explanations could be provided, so that in the next round of answers the picture would be somewhat clarified. What happens however, too often in my opinion, is that the inquirer abandons the subject, as if suddenly it ceased to be interesting. Readers should understand that it is quite frustrating to be left without further indications as to what was really needed (if it is logical and answerable at all to begin with). and fill in the short Form appearing there, to let me know if and how much you value my advice. At the very least I would be glad to get a sign of acknowledgment. Is that asking too much?" Please consider that the writer would appreciate that the inquirers be so kind to consider this simple request. 14.1 - FABTECH India colocated with Weld India. April 10–12. Pragati Maidan Exhibition Complex, New Delhi, India. 14.2 - JOM, 18th Int’l Conf. on Joining Materials. April 26–29. Konventum LO-Skolen, Helsing?r, Denmark. 14.3 - First Int’l Symposium on Advances in Resistance Welding.